Commercial Radio Company refurbishes radio transmitters, sells hard-to-find parts for a variety of electrical devices, and services technical equipment. The owner, Dan Churchill, worked for General Radio for four years while studying at Massachusetts Institute of Technology and went on to become an engineer at RCA for 25 years. Churchill established the company in 1970 to provide specialized expertise companies, universities, and individuals in need of service for radio transmitters and other apparatuses. Based in Cavendish, Vermont, Commercial Radio Company ships internationally; we are proud to be your professional source for transmitter information and components. 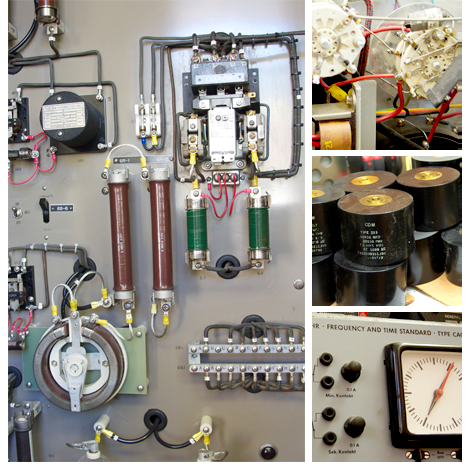 We carry a large stock of mica capacitors, oil capacitors, isolantite insulators, RF contactors and RF panel meters. Looking for a particular part that you don't see here? We may still carry it; please call us as we may have it in stock. We're happy to answer any questions you may have. To place your order, please contact us via phone (802.226.7582) or fax (802.226.7738).